Pokémon was one of the most popular shows when I was growing up, and it was one of my favorites. I watched so many episodes that I’m still able to sing along with the theme song. So it has been fun seeing my children start to enjoy this thing I loved as a kid with all the new Pokémon products. 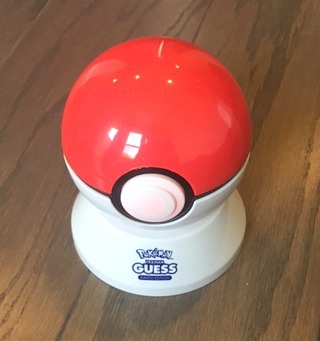 One of the new Pokémon products that my kids tried was the Pokémon Trainer Guess Game. What is the Pokémon Trainer Guess Game? The best way I can describe it is that it is like the 20 questions game. As you can see above it is shaped like a poke ball which is fun, it makes you feel like you are actually “catching” Pokémon. To start the game you press the white button and the game will start to ask you yes or no questions to try and guess the Pokémon you are thinking of. If it guesses that Pokémon right than you catch it and it becomes part of your collection. Once you have caught them all you also have the option to reset it and start again! This is what the game looks like out of the box. It is small enough that it fits great in your hand but not too small that you have to worry that someone will choke on it. Along with the poke ball you also get a stand for it to sit on. The stand makes for a great place to store the game while you are not playing with it. It also comes with a Trainer Field Guide. This is great for multiple reasons. 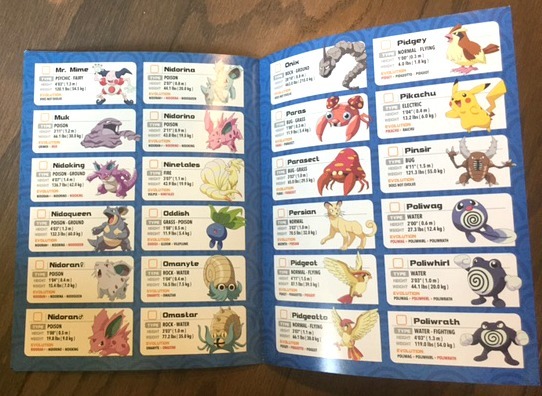 First as you collect Pokémon you can mark them off in the book, so you don’t have to listen to the game list them all off. Second it is a good way to easily think of new Pokémon for the game to guess once you have collected the ones you can think of off the top of your head. Lastly it allows for children younger than 6 to play. My daughter is 4 and loves to play with this game. She looks through the guide and finds a Pokémon. Then she starts the game and is able to answer the questions based off of the picture in the trainer guide. One more awesome thing about this product is that it retails for only $19.99! Who do you know who would love this for Christmas? What is their favorite Pokémon? Let us know in the comments! « Tap into your child’s imagination with a Piper Computer Kit! Hello. So my 6 year old boy for this from Santa this year. Just what he asked for. However the trainer book got tossed out with the packaging 🙁 I cant seem to find it anywhere online where I can print it 🙁 any chance you could take photos or have any suggestions other then purchasing the game again?